When Krzysztof Kmiecik first opened Loyola’s outdoor skating rink in February 2014, he never thought that this year might be its last. According to Patrick Boivin, director at Concordia’s Department of Recreation and Athletics, the department made the initial investment—the wood and labour—when the rink was first built three years ago. Boivin said the majority of the material is still there, waiting for students to go forward with the initiative. However, “knowing what the temperature was last year, I don’t there is an intention of having the rink out this year,” said Kmiecik. Today, climate change’s effects on outdoor rinks extend far beyond those felt at Loyola’s campus. In early November, the City of Montreal revealed a three-year plan to spend $7.3 million on outdoor refrigeration systems to preserve its skating rinks. The city maintains about 275 skating and ice rinks, some of which are refrigerated. Outside Montreal, outdoor skating rinks across Canada—long a centrepiece of North American culture and identity—risk being washed away by warmer climates and unpredictable weather. And this shouldn’t be news. 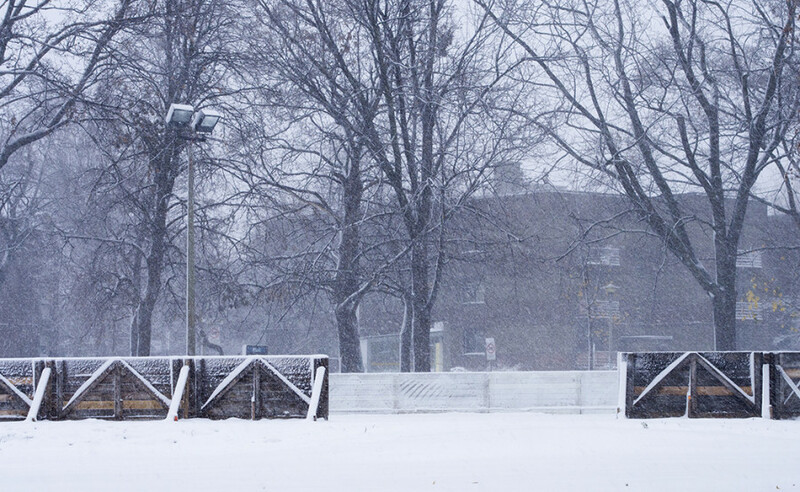 In 2012, Damon Matthews, a climate scientist at Concordia, worked alongside two McGill researchers to study global warming’s effects on building outdoor skating rinks in Montreal. Their studies revealed that to form the ice needed to build a rink, the air temperature must remain below 5 C for at least three consecutive days. Climate change, however, threatens to disrupt the temperature’s consistency. Matthews’ study further showed that although the skating season is starting at the same time it did more than 55 years ago, it’s ending much sooner—by as many as 15 days in some cases. Beyond Canada’s borders, the consequences of global warming are direr than the loss of outdoor hockey and skating rinks. “But here in Canada, [outdoor hockey] is something that people care about and it’s something that will likely be lost if we continue the way we’re going,” he added. Four years ago, when Matthews first concluded his study on global warming’s effects on outdoor rinks, The Globe and Mail, The Guardian and the National Post reported his findings. Today, with time slowly running out, his message remains the same—if not more urgent. Last month, Prime Minister Justin Trudeau took a step towards addressing climate change in Canada, announcing that provinces must adopt a carbon-pricing scheme before 2018 or else the federal government will impose one for them. The root of the problem needs to be addressed, Matthews said, instead of covering the problem with costly band-aid solutions. The current stopgap proposed by the city—refrigeration systems for outdoor rinks—may extend the skating season, albeit at a cost to taxpayers. Dimitrios Jim Beis, member of Montreal’s executive committee responsible for Sports and Leisure, told CBC earlier this month that he estimates each rink to cost between $1 million and 1.5 million. Today, countries across the world are scrambling to adapt. In October, Canada joined more than 60 countries that have officially ratified the Paris Agreement—a commitment to curb emissions and prevent global temperature from rising more than two degrees Celsius. Without real changes to suppress greenhouse gas emissions, however, rising temperatures could become the norm. This year, Montreal experienced its hottest summer on record. And on Saturday, Santa Claus rode down St Catherine St. for his annual Christmas parade in a one horse open sleigh in 14 C.
With outdoor rinks now on the brink of extinction, this generation’s Grinch isn’t green, but rather the product of eschewing green energy. Tomorrow, global warming risks taking away not only Christmas, but also a Canadian favourite that comes with it: outdoor skating rinks.